After visiting Harajuku, Marcus and I decided to walk most of the way to Shinjuku from Harajuku. Walking is an awesome way to get to know a city if it's your first time there, and I wasn't feeling up to spending a long time on the the train. It was a fairly long walk, but definitely doable. Most of Shinjuku definitely has that 'Big city' vibe, and it feels quite corporate to me. 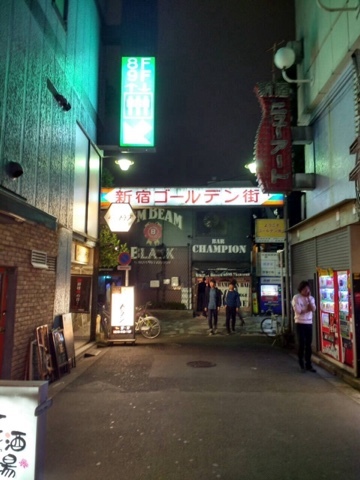 But just around the corner are two awesome places that I'm so glad I got to see: Kabukicho and Golden Gai. First up: Kabukicho. It's the 'entertainment' district so I was a bit scared to go, but we went at around 5pm so it was fairly quiet. Definitely worth a quick walk through if you're in Shinjuku. Next up was Golden Gai: Such a contrast to the earlier buildings! You're not really meant to take pictures I don't think, so there's only a couple here. It is a maze of small, two story buildings and they are all teeny tiny bars! I didn't go in, because being ill is not the best time to be drinking. Next time! Even if you're not drinking, it's a really fun place to just wander around and get lost in the chaotic mess of tiny alleyways, narrow streets and neon signs. Again, we went in the early evening so I'd imagine it gets a lot busier later on.